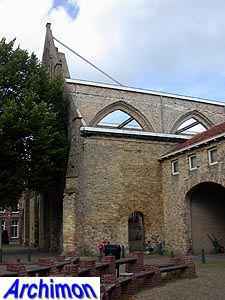 The Broerekerk was built as part of a Franciscan monastery that had been founded in 1270. 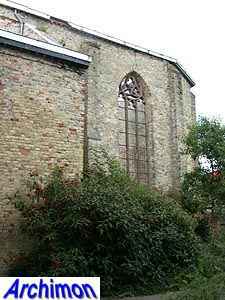 The church was built in two phases, starting in 1281, and was probably completed in 1313, which makes it the oldest building in Bolsward as well as one of the oldest Gothic buildings in the Netherlands. It's a three-aisled pseudo-basilica in a mostly simple Gothic style. 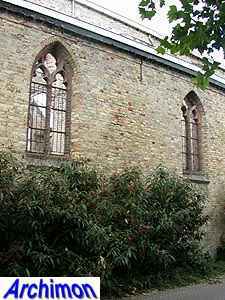 On the north side the gable of a pseudo-transept can just be seen. The facade is the richest part of the church, and is decorated with a climbing frieze. 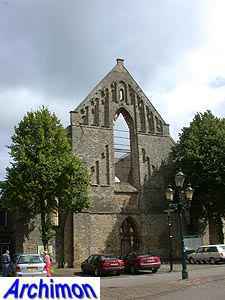 It served as a monastic church until 1572. That year the monastery was forcibly closed and confiscated. 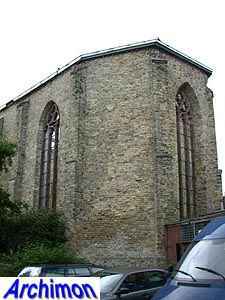 The church became a protestant church while the other monastery buildings were demolished. In 1623 and 1779 the churcgfwas restored, while in 1684 a polygonal lantern-tower was added to the top of the facade. By 1870 no more services were held in the church and its maintenance was stopped. Plans to demolish it in 1885 caused controversy nationwide and were blocked by the Minister of Internal Affairs and eventually resulted in the recognition of the importance of the church. For the time being it was used for exhibitions and storage of cheese. 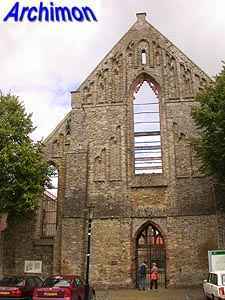 In 1900 a majority of the protestants voted against the sale and the successive demolition of the church. 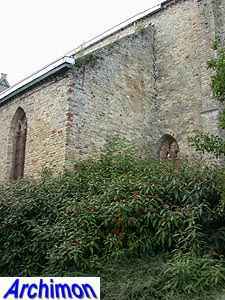 A plans to sell the church to the state for use as a post-office didn''t succeed either. 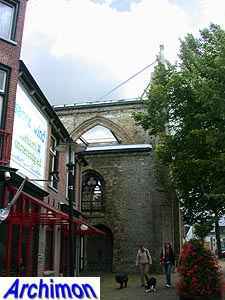 In 1902 the protestants voted about another plan; to sell the church to the mayor of Bolsward on the condition that it would be a used as a protestant church again after it was restored. This plan was approved by a big majority. 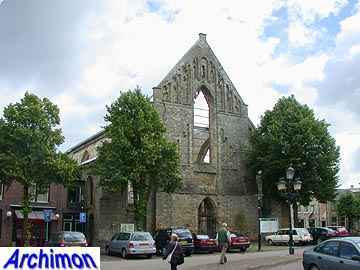 In 1903-1907 the church underwent a major restoration by plans made by J.Th.J. Cuypers. 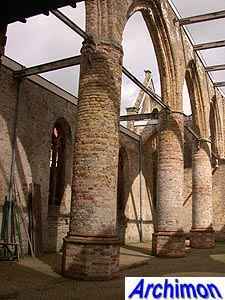 In 1980 the roof and the wooden vaults were destroyed by fire. 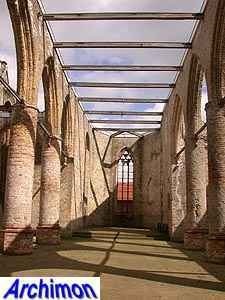 The ruins of the church were consolidated in 1986 and in 2005-2006 they were finally protected by the addition of a glass roof construction. The pictures on this page were made in August 2005, a few months before work started. 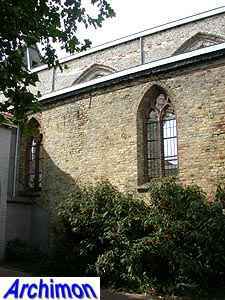 The former church is nowadays open for public and can be rented for cultural and private use.